As Nora grapples with her unresolved anger regarding her father's disappearance in the future, Team Flash must stop a new villain - The Weather Witch - from killing The Weather Wizard! At the same time, Cicada ponders how he became who he is and what he will do next, as it seems the police are hot on his trail. Logically, Nora's complaints about Barry nearly dying don't make much sense since the fact that she continues to exist means that Barry must survive. Reference is made to Mardon's Weather Wand. While he did briefly use the device to focus his powers in Season 2, the wand was originally built by Cisco Ramon to counteract Mardon's metahuman abilities. Freed from the need to grunt and looked pained, Chris Klein gives a great performance here in the flashbacks as he shows how Orlin Dwyer became Cicada. The character of Weather Witch is loosely based on a character from the Flash comics named Joshua Jackham, who first appeared in The Flash #170 in March 2001.The biological son of CCPD cop Julie Jackham and Weather Wizard Mark Mardon (The two had a one night stand with neither one knowing the other as a cop or criminal respectively), Joshua was born with the metahuman ability to control the weather. This caused Mardon to seek out his son, hoping to find a way to transfer his son's powers to himself. Joshua was later killed by Kid Zoom during the events of Final Crisis. Jocelyn "Joss" Jackam is a delinquent teen turned amateur storm-chaser. Abandoned by Mark Mardon as a child, she wanted revenge on her dead-beat dad. Her discovery of a piece of meta-tech (i.e. a weather vane that could control the weather) gave her the power she needed to go after he father. She is given the name of Weather Witch. There is an ironic twist considering the two different characters. In the comics, Mark Mardon gains his powers from technology and has a child who has weather-control powers. In The Arrowverse, Mardon becomes a metahuman and his daughter uses technology to replicate his powers. Weather Witch asks for her father to be taken to Porter Plaza. This is likely a tribute to Howard Porter - one of the artists on The Flash monthly comic. An experimental cold fusion core from Mercury Labs is located in the power plant The Weather Witch first attacks. Nora is able to rub her hands together to generate electricity, acting like a defibrillator. A weather-vane tool Joss used became infused with a satellite shard, creating a meta-tech staff that let her control the weather in the area round her. Using old fashioned meteorology equipment, Sherloque detects an artificially created pressure system of uncertain origin heading for downtown before Cisco's satellites detect it. Sherloque: I don't understand. Explain again to me what is the difference between this day and every other day in America? Cisco: It's a holiday, when we all get together and celebrate and eat a ton of food. Like, a gross amount. Sherloque: Again - what is the difference between this day and every other day in America? Orlin: Well, I was thinking that, while I work on this place, we could... work on this one too. Together? (pauses) Listen, you were right, kid. I do hate me. I don't really know any other way to be. But... I want to do right by you, Gracie. I want to keep you safe and warm and fed. You know? Just.. give you all the things a kid should have. Grace: Let's start with the dollhouse. Barry: Nora... people need The Flash. Nora: I need my dad. Cisco: By the beard of Zeus, she's making a tornado out of lightning! Killer Frost: All right, boys. I'm tapping in. Killer Frost: All right. So let me get this straight. You two losers are sitting here, in what I can only assume is the cantina of a starship, drinking and eating terrible food, when you could drinking and eating amazing food with people who actually care about you. Sherloque: She has a good point. Cisco: You have a good point, yeah. Killer Frost: And by the way? I have the least to celebrate this year, because I spent most of it unconscious. Killer Frost: Are you nerds coming to Thanksgiving or not?! Weather Witch: I'm so pissed! This city will drown, crumble, burn, because of you! Barry goes to Grace Gibbons's hospital room but is stopped by Dr. Ambres. She says that Grace's parents are dead and she has no legal guardian and she has the charts to prove it. Cicada's name is confirmed, by the flashbacks, to be Orlin Dwyer. Grace Gibbons is his niece, the daughter of his sister, who was killed in a metahuman attack. 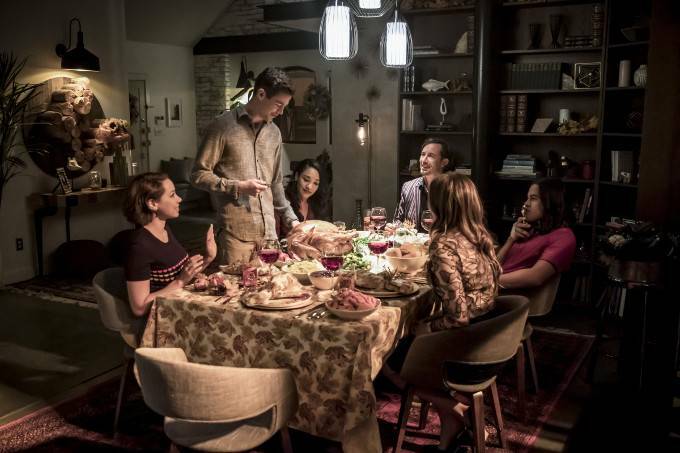 It's Barry and Iris's first Thanksgiving at their loft. Caitlin is now able to talk to Killer Frost telepathically without using the mental activity dampener. Joe and Cecile are spending Thanksgiving with Cecile's family. Nora and Iris seem to be getting along better. The Flash Museum has a 3-D model of The Flash running into the Singularity from 201. However, the display doesn't mention Ronnie Raymond's sacrifice. Dr. Ambres faked the charts which she showed Barry. She tells Orlin she thinks he needs to stay way from Grace from now on. Orlin Dwyer originally did not want to take custody of Grace. Sherloque's Earth does not celebrate Thanksgiving. Sherloque has no family, apart from his five ex-wives. None of his seven marriages resulted in children. Sherloque indulges in art therapy in his downtime. Grace became a problem child, as she copied Orlin's cursing habit. Cicada is currently strong enough to dent a refrigerator door by punching it. Weather Wizard was last seen in 209. Joss Jackham breaks into Iron Heights Prison trying to get to her father, Weather Wizard. Mark Mardon fathered Joss when he was in high school and abandoned her and her mother, thinking they'd be better off without him. He claims not to have spoken to her in years but he knew she and her mom had an irreparable falling out. Orlin Dwyer had a cousin named Robbie, who said Orlin and Grace could stay at a house he owned if Orlin fixed it up. It had a doll house, which Orlin asked Grace to help him fix. Sherloque ruins Cisco and Caitlin's Thanksgiving cheer - first by pointing out how bad their years were and then by pointing out that the story of the first Thanksgiving is a myth that puts a happy face on the colonization of the United States and subjugation of the native peoples. Jocelyn "Joss" Jackam is a delinquent teen turned amateur storm-chaser and is a self-taught expert in theoretical meteorology. She lost her grant from the Science Center for taking too many chances with her experiments. She had a storm-chasing van with the name Weather Witch painted on the side. Joss wants to kill her father for being a neglectful jerk. Thankfully, the Weather Wizard she tries to drop a car on is a hologram played by Iris. Nora tries to get Barry to give up being The Flash so they can have a life together in the future. The night of The Enlightenment was the one year anniversary of Orlin Dwyer promising Grace that he was going to be a proper parent to her. He bought her a doll set she wanted for her doll house, bought her three ice creams and took her to the carnival to celebrate. Orlin was struck in the chest with a piece of shrapnel from the STAR Labs satellite. Grace was knocked unconscious in the middle of the disaster. Weather Witch attacks Sheldon County Airport. Cisco suggests using the Weather Wand, last seen in 220, to counteract Weather Witch's powers. The meta-tech is revealed to be stored inside The STAR Labs pipeline until they figure out how to remove the shards. It is revealed that the reason Grandma Esther's yams had a distinctive crunch was because she never washed her best skillet. It is revealed that Cicada's dagger is made from the piece of shrapnel that pierced his chest on the night of The Enlightenment. Sherloque has the idea to check the hospital security footage to see if anyone has been visiting Grace in secret. This leads them to identify Orlin Dwyer as Cicada.